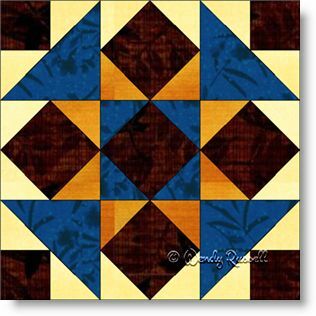 This nine patch block features the underused (at least in my opinion) quilt patch called the square in a square, using some colour variations to make things interesting and creating the secondary pattern of a star. The half square triangle cut pieces are sewn on the edges of square pieces to create a different patch than the usual use for half square triangles -- which is to create a square using two different triangle pieces. All in all, this block is not difficult in any way, but you get a little different sewing practice. The sample quilts illustrated use a side by side block setting as well as an on point setting to give you ideas for creating your own special quilt.